Another family birthday coming up and I thought I would use the sketch created by Sharon over at Truly Scrumptious. The twist, was to use stash that had been forgotten and I had forgotten a lot. I buy things because they are pretty but when I get them home there doesn't seem to be anything that will go together. I know this is my own creative block but I spend days looking for the right paper and embellishments and usually miss the challenge completion date! When time allows I like to view other craft blogs and see some fantastic creations. I am always drawn towards the vintage style so thought I would have a go. This is my first attempt and although I have a long way to go I quite like the result. I only hope it's not too old fashioned for my Niece! The items I forgot I had and used were: Fairy sticker sheet Wedding and Romance papers from Hot off the Press Lace With Love brad I also used Tim Holtz Distress Inks, Pale yellow card, Papermania Signature Regency paper Silk cream rose, Grosgrain ribbon Hot Foil Wizard for the words. I'm off to the Newbury Stamping Craft Show at the weekend so no doubt I will come home with more goodies. Thanks for taking the time to check out my design. This is so pretty. Such an adorable fairy and I love your pleated lace. Thanks for joining in our TS challenge. This is gorgeous Jenny, so pretty. 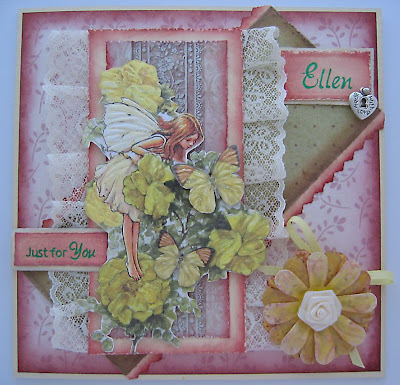 Fabulous colours and I just love how you've used that beautiful lace.